Binn Mhór overlooks Mám Éan. This is the site of a pattern held annually on the last Sunday of July, known locally as Domhnach Mhám Éan and as Domhnach Chrom Dubh (MacNeill, 123). It is also visited on St. Patrick's Day and Good Friday. Roderic O'Flaherty wrote in 1684: At Mam-en, there springs out of a stone a litle water, named from St. Patrick, which is a present remedy against murrein in cattel, not only applyed, but alsoe as soon as tis sent for they begin to have ease. next Mam-en are the mountains of Corcoga, in the confines of Balynahynsy [Ballynahinch], Ross and Moycullin countreys, where the fat deere is frequently hunted; whereof no high mountain in the barony of Balynahinsy, or the half barony of Rosse is destitude (O'Flaherty, 121-22). This peak has been called Shannakeala. Binn Mhór is the third highest mountain in the Maamturks area and the 177th highest in Ireland. Picture from csd : The Twelve Bens and Binn Chaónaigh, seen from the summit of Binn Mhór. 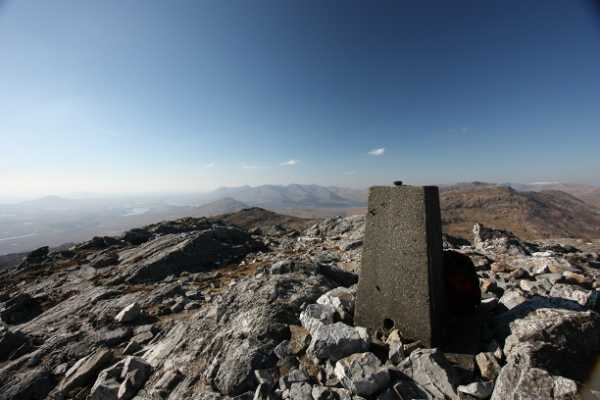 Picture: The Twelve Bens and Binn Chaónaigh, seen from the summit of Binn Mhór. Seven years to the month, I return with a different perspective on Binn Mhór. I parked at L893 492 B, where there's space for a couple of cars in case the main car park up the road is full. Heading northeast, I skirted the north of the forest (shown on the Harvey map), before heading for open ground, approaching Binn Ramhar, the smaller top west of Mhór itself, from the west. It's an unforgiving slog if you're any way out of shape, but once up at Binn Ramhar (worth making a stop at on the way to Binn Mhór), the views on a clear day make it all worthwhile. I was blessed with perfect weather, and in these conditions the views are spectacular. The area around the summits of Binn Mhór and Binn Ramhar is dotted with rocky pools, which peer over the edge of jaw-dropping views over to the Bens and the main ridge of the Maamturks to the north. Further distant, Mweelrea itself was visible, still capped in snow as the recent cold weather extends into spring. My (careful) descent was via Mam Ean and I then followed the Western way west back to the road and my car.